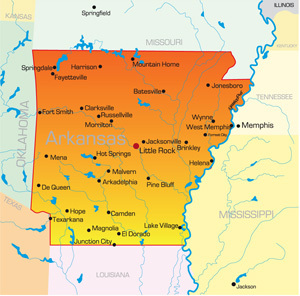 Arkansas is the 32nd most populous state in the United States and is nicknamed the Natural State. The unique culture of the state can be seen in museums, theatres, restaurants and tourist attractions throughout the state. The capital of Arkansas is Little Rock which has a population of nearly 200,000 people. There are two major university systems: Arkansas State University and University of Arkansas which combined educate thousands of students every year. The major highways are I-30, I-40, I-55, I-555 and I-49. Attractions within the state include Blanchard Springs Caverns, Buffalo National River, and Hot Springs National Park. Sports are also a large part of the culture. Large crowds are drawn to football games at the University of Arkansas or baseball games at Dickey-Stevens Park in North Little Rock.